The Massachusetts Clean Energy Center is thrilled to announce $455,000 in funding to the spring 2018 round of Catalyst awardees. 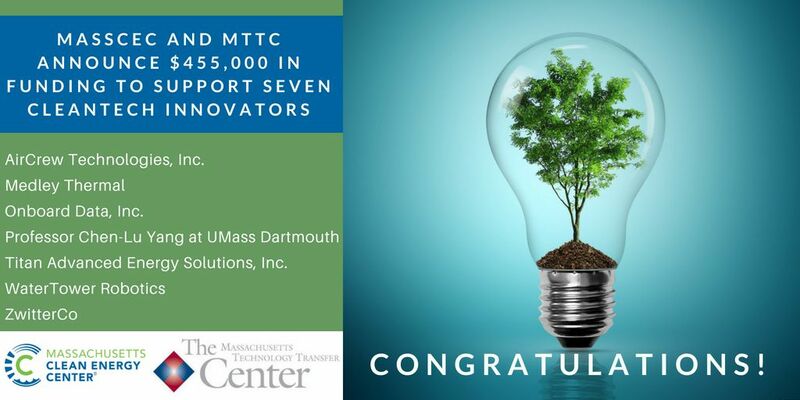 The Catalyst Program is jointly administered by MassCEC and the Massachusetts Technology Transfer Center (MTTC) with the primary intent of stimulating the commercialization of early-stage clean energy and water-energy nexus technologies developed in the Commonwealth of Massachusetts. Funds are awarded to university researchers and early-stage cleantech companies. Grant funding, coupled with business mentoring, is employed to move cleantech prototype and research projects towards commercialization. AirCrew Technologies, Inc. (Allston) is developing a new process for the creation of more durable catalyst materials with less loading of expensive and rare metals. These catalyst materials will have longer lives and improved catalytic activity compared to conventional materials, making them more cost-effective. Because they have lower temperature requirements than conventional catalyst materials, they also result in energy savings in important industrial processes. Medley Thermal (Cambridge) will prototype an optimized “dynamic electrification” system for industrial steam users. This system will automatically switch between electric and fossil-fired boilers to capture cost savings for steam offtakers, while promoting a cleaner and more responsive grid. Onboard Data, Inc. (Cambridge) is developing a software tool to automatically tag and clean building sensor data as a tool to use in building energy management applications and improve buildings’ energy performance. Titan Advanced Energy Solutions, Inc. (Cambridge) will prototype an ultrasound-based device to cost-effectively and rapidly measure the health and state-of-charge of electric vehicle batteries. This technology will extend battery life and reduce the environmental impacts and costs of battery recycling. Professor Chen-Lu Yang at the UMass Dartmouth (Fall River) will build and validate a model that can be used to scale up a new chemistry for desulfurization of biogas produced at landfills, agricultural sites, and wastewater treatment plants. After desulfurization, biogas can be used as a clean fuel for power generation and other applications. WatchTower Robotics (Cambridge) has developed a sensor that can travel through municipal water pipes and detect leaks with high spatial resolution. The company plans to validate the leak detection technology through pilot projects in Massachusetts and elsewhere. ZwitterCo (Cambridge) aims to commercialize a new, zwitterion-based membrane technology that can substantially reduce energy consumption needed for water purification in the food and beverage industry. The next round of Catalyst launches in August 2018. Sign up for our News for Startups newsletter to stay in touch on MassCEC programs and resources for clean energy startups!